Few months back, despite of all odds, I attended an event by Mozilla which was WebMaker event, where I along with my friend Vikram (I literally had to force him to attend, since the event was far away and we were tired on that day), visited to know more about WebMaker Project and in a hope to start contributing by asking people around. There I met Anup Kumar Mishra and Ajay Kumar, (both being Mozilla Reps) where they were telling about WebMaker project. At the time, I was struggling to get started to contribute to Mozilla and they told me to drop a mail, and they would help me. I did that immediately, and also got help from them. I came to know that they're trying to re-build Mozilla Delhi community and want some active contributors. But I'll try to summarize all that in this post itself. Non-Technical Contributors, who promote Mozilla and it's various products. They'll manage all the events, arrangements and other managerial tasks. Next, in order to establish and let people know about Mozilla Delhi, we decided to build a website representing Mozilla Delhi. For that, we gathered some more contributors as we needed front-end people, back-end people, UI/UX designers etc. I reached my developers friends and told about awesome opportunity to contribute. Thus I invited Nikhil Handa (as he's good in UI/UX), Manraj Singh (back-end and some front-end), Akansh Gulati (front-end) and some other people. Meanwhile, I was also being actively being pinged on facebook by people to know more about Mozilla Delhi and start contributions. I was trying my best to guide them further. Meanwhile, we were planning things on slack (mozpacers.slack.com) and decided to have Dev Sprint v1.0 to decide upon the Website, finalize the wire-frame, distribute responsibilities, choosing tech stack for the creation of website, et all. Dev Sprint v1.0 was planned to be at Zopper (the same company I'm doing internship at). 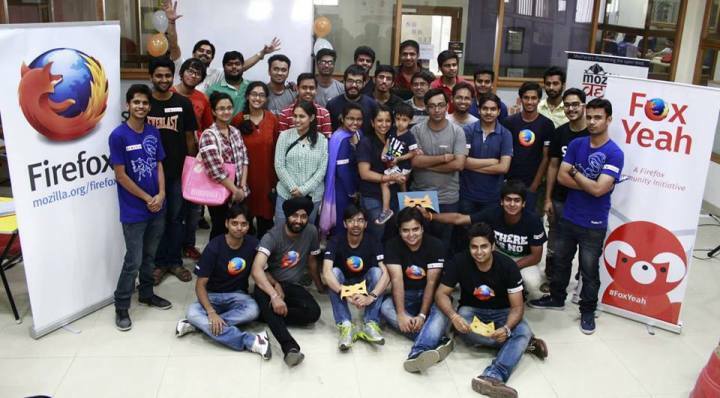 Thanks to Co-Founder Surjendu Kuila for sponsoring Mozilla Delhi's DevSprint v1.0. So, we gathered at Zopper and started discussion on the initial wire-frame and using whiteboard, we tried to gathered more requirements and listen to what everyone has to say. Different points were put forward by the community members regarding design, functionality and other non-functional requirements. When majority of people agreed upon the design and details, we made a separate list of those tasks. Those who had some concerns about the design and functionality were explained the approach. After brainstorming and lot of discussions we mutually agreed upon a design. We decided to go with SPA (Single Page Application) as per the initial wire-frame, and decided upon technologies to be used for the creation of the website. Back-End: REST API using Flask (micro web framework for Python), MongoDB for the database. We also finalized using git to be our version control system in this project and made repo on github. We also decided to use git-flow as it would help us in near future for better maintenance and everyone was suggested to make features and work on them. Community members mutually agreed on the official coding guidelines and structuring of code as per the language they're coding in. (For example, for Python PEP8 standards). People started picking out different front-end sections and implementing them. Most of the front-end is now finished. Meanwhile I picked up the back-end and implemented it. Though there is much more to be done as in integrations with the front-end and security constraints, I think we've learnt a lot along the way. Hopefully in DevSprint v2.0 we'll finish the website project and make it live. Are you in Delhi and want to contribute? Then join us at Dev Sprint v2.0. For more details, please follow the official Mozilla Delhi channel on twitter.